There’s nothing like a family vacation to drop one’s guard a bit and see things from new and interesting perspectives. Over the winter holidays, my family and I traveled to Copenhagen to fetch our oldest son after his six-month college foreign study ended. The trip provided a great chance to look at four European capitals and to see how they handle bike transportation issues. America's non-motorized advocacy community often laments that our cities do not have infrastructure systems like European cities or that when they do invest in non-motorized infrastructure the bicycle lane remains empty while the culture seems stuck in the 1950s; this was finally a chance to see what "they" do, and maybe form a couple of opinions about how it might work here. In 30 years of practice as a non-motorized transportation planner, I have heard almost nonstop from the urban design community – and to a lesser degree from transportation planners – about the remarkable resurgence of bicycling in Copenhagen, particularly the 33% share of commuting done by bike and the series of “cycle tracks” (physically separated bicycle lanes) that accommodate these many thousands of Copenhagen cyclists. Witnessing it first hand is a powerful experience. While we scurried about the city, the temperature never got above 19F, so instead of seeing tens of thousands of cyclists every day, we merely saw thousands. It became natural for me to compare our two cities and cultures and to reflect on whether the American urban design community has considered certain distinctive but highly influential differences - in our physical stting, our legal environment for cycling, and even in our cultural approaches to bicycling. 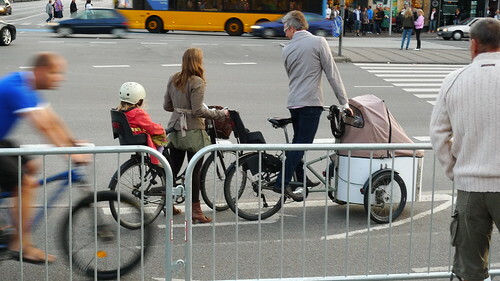 The riders of Copenhagen struck me as vastly different from American riders. 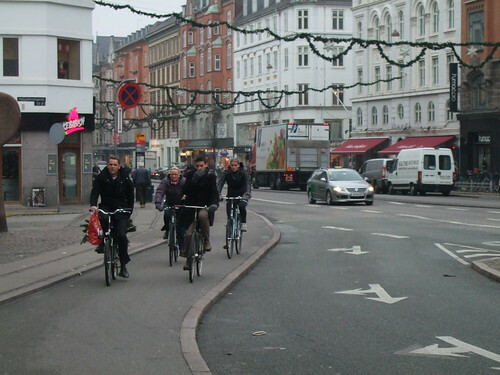 It’s hard to describe the Danes as “bicyclists” in the same context as American bike commuters. First, the bikes that the Danes ride are simple and often in relatively poor mechanical condition. Admittedly, when your commute is as flat as billiard table you don’t need much. Still, in a town as self-assuredly cool as Copenhagen, one doesn’t see fancy bikes or hipsters on “fixies.” In fact, bike theft is seen by residents as a major problem in town and riding fancy bikes is seen by some as an invitation to trouble. Most bikes are relatively inexpensive - what our experienced riders here might dismissively refer to as "department store bikes." That stands in stark contrast to our daily downtown commuters in most US cities. Here we see well-maintained, well-equipped bikes with indexed shifting, triple chainrings, waterproof panniers and riders in full racing regalia; commutes for 8-plus miles one way are common. In Copehagen, we see office workers in full-length wool coats and knee-boots, with rarely a cleated shoe or helmet in sight. Here, riders spin in low gears and move at 16-18 mph on our avenues, hills, and boulevards; in Copenhagen, it is rare to see someone riding more than 10-12 mph. Our bike culture is one of avocational cyclists – those who ride for the enjoyment, fitness or environmental consciousness that accompanies riding a bike in an auto-dominated environment. Riding in such an environment requires skill, preparation, and dedication – a certain pride in survival seems a natural by-product for our urban riders. For the Danes, the bike is not avocational, but rather it is instrumental: a simple, efficient tool to get to work, which may be why it all works so well for so many practical-minded Danes. Why does this matter? If we are to truly “Copenhagenize” cities like Seattle, we would need to change the transportation system framework in a manner that will cause the very individuals and organizations who have dedicated themselves to creating a better environment for bicycling in Seattle to take serious pause. Thirty years of dedicated advocacy work is hard to change, without a clear sense of what could be gained or lost.